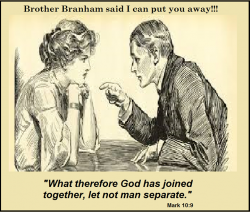 One of the controversial teachings of William Branham is the subject of Marriage and Divorce. The Bible claims, if a woman cuts her hair, a man's got a right to put her away in divorcement, because she's not honest with him. We have to get down and preach the Bible here some of these days. Said, "If she bobs her hair, she dishonors her husband." If she's dishonorable, she ought to be put away. You can't marry another one, but you can put her away. Whew. Boy, that—that's going hard; I can feel it. But that's the truth. I can prove by the Bible that any woman that'll bob her hair has a legal right in the sight of God for her husband to divorce her. Hair… That's the Scripture. Now, if you don't believe it, lay the question up here tomorrow night, and I'll show you. That's right. That's right, but what do we do? The Bible says it's a common, sinful thing for a woman pray with her hair cut short. That's right. And yet we… You put all this make-up on, but what does it do, friend? There's only one woman done that, and you know what God did to her? He fed her to the dogs. So if you see a woman wearing that, say, "Howdy do, Miss Dog-meat." That's exactly what she was. God fed her to the dogs: Jezebel. You know you don't want to be of her daughters, but I don't blame it on you. It's because it's tradition. It's handed right down, and it's a disgrace. Looky here. It used to be, a long time ago… And you holiness people, it was wrong for you women to cut your hair. What became right about it, when the Bible said that a, "If any woman cuts her hair off, her husband has a right to give her a divorce." Plain teaching, but that's the Bible. Here not long ago, a man wanted to introduce me to his wife, a great holiness organization. Said, "My wife is going to play the piano tonight, Brother Branham." And I looked at her, and the woman... I ain't making fun of the woman; I don't believe in doing that. I'm only telling what's the truth. And I want you to receive it in the same way of love. I have to be stern once in a while. Yes, sir. And the Bible rights gives any man a right to leave and divorce and leave his wife, that'll cut her hair. That's the Bible. That's THUS SAITH THE LORD. That's one of the Words, for the Bible said it's wrong for a woman to cut her hair. That's right. If she does, how is she going to get in? See? Just ask, any preacher will tell you the Word says that. See, "she dishonors her head," she dishonors her husband. She should be divorced. That's exactly right. "For she that will cut her hair, let her also be shorn off, shaven." See, it shows through that. Not just bobbed, God don't want it that way. That's that Mister In-between. Don't fool with it. Either cut it all off or leave it grow, that's what God said. Any minister of the Gospel knows that's the Truth, whether you'll say it or not. But that's the Truth. See? Well, what good, if you're going to do all the rest of them, and leave that go? This page was last edited on 27 December 2016, at 23:14.